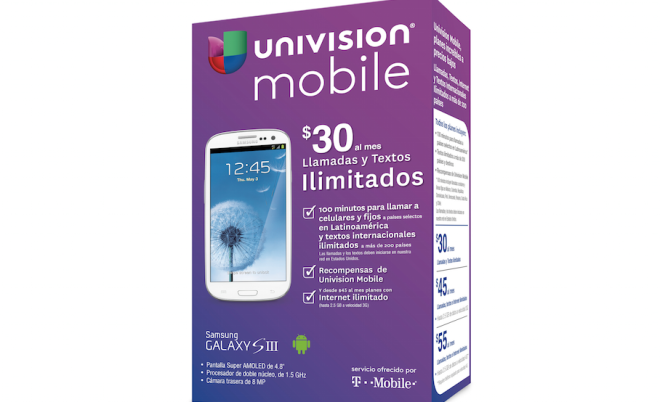 As we’ve heard a couple of times from our sources now, T-Mobile and Univision have announced a new prepaid MVNO dubbed “Univision Mobile”. It’ll launch on May 19th, exclusively at Walmart and independent dealer locations across the U.S, including Puerto Rico. The carrier’s “affordable, no annual contract plans” will start from as little as $30 per month. But there are also some pretty attractive add-on features available. For $10 per month, subscribers can add 1000 minutes to Mexican mobiles and/or landlines with the Mas Mexico Connect feature. Another $10 add-on offers unlimited landline calls to 70 countries. And just as we revealed exclusively, here at TmoNews, all plans will include international features. Those include 100 mins to call mobile or landline numbers from the U.S. to eight Latin American countries and unlimited international texting from the U.S.
Well, more users = closer to the #3 spot! Will this count towards their bottom line and subscribers? It’ll definitely count towards the bottom line. I’m pretty sure it includes subscriber count as well. I think I read, during the most recent earning reporting, that they count the mvno subscriber base as well. I don’t see why they shouldn’t. Well, this is good because it means more money to continue helping their network expansion and upgrade. I was just in Orlando where there are many T-Mobile users and the speeds were amazing. I was able to get 61mbps inside Disney. Yea, most of the park has WiFi and it’s pretty good but over 50mbps compared to 6 to 10mbps I think the higher speed is better now that you use a Disney app to help with fastpass selection. I was thinking they did since I know that Sprint does it too and I know Verizon did too years ago when I worked there. Yes. It’s why – during earnings calls/results – you’ll see an overall “net adds” and “branded net adds”. One includes all the MetroPCS additions as well as T-Mobile, while “branded” is just T-Mobile. “$45 plan includes up to 2.5GB of 3G web, then slowed to 2G speeds for remainder of account cycle” Does that mean HSPA+ speeds while on LTE? Or is it like the AiO wireless 8 Mbps down 4 Mbps up caps. You’re forgetting that only people into tech think of HSPA+ as 3G. So, obviously not. Exactly. I think the fact that there’s no mention of LTE anywhere is a pretty clear indication that it means HSPA+ when it says “4G”. Read about this earlier on WPCentral. There were a couple of trolls calling this whole thing “racist,” which is ridiculous. I think it’s a good idea. There are several other MVNOs that offer the same price and better data, and targeted towards the same market. For example, H20 Wireless offers UL Talk, Domestic Text, International Text, 500MB data and $5 International Talk credit all for $30 (all inclusive, even Sales Tax). It runs on the ATT network. They also have the addons like ‘Portal’, free gifts, lucky draws, Spanish news, etc. It’s actually 100 incoming international texts and UL outgoing international texts. Still, quite competitive! I found the H2O Bolt pretty interesting: UL 4G hotspot for just $50. This is suitable even for home Internet. While that might be the case, you can’t underestimate the power of the Univision brand. Just having that name alone will appeal to a lot of people. As a Puerto Rican who grew up in New Jersey, I saw the impact Univision had on my family. My grandmother, grandfather, mother, uncle, and large portions of my family that did not necessarily assimilate as strongly as I did are super involved with Unvision. That is their news, that is their soap operas. that is their entertainment, their weather, etc. That name carries weight in the Hispanic community. It’ll do them good for sure.